Bringing Home Hermit Crabs? Don’t Do What I Did. These cute critters need a warm, humid environment in which to thrive. When I was younger, one of my favorite things to do was catch hermit crabs down at the beach. In fact, once I actually took home 12 of them, gave them all names and promptly scared the bejeezus out of my mother when one got loose and ran across the car’s dashboard while she was driving. However, knowing what I know now, I might not have been as quick to take my new friends home. Hermit crabs are fun to watch, but they require a certain level of care. Here’s a basic look at some of the things I should have considered (to be fair, I was only 11). Nonetheless, now you can learn from my mistakes. How many hermit crabs will I have? What types of equipment will the aquarium need? Hermit crabs love toys, so what toys do I want to include? “It is most economical to buy a 10-gallon aquarium rather than one of a smaller size. 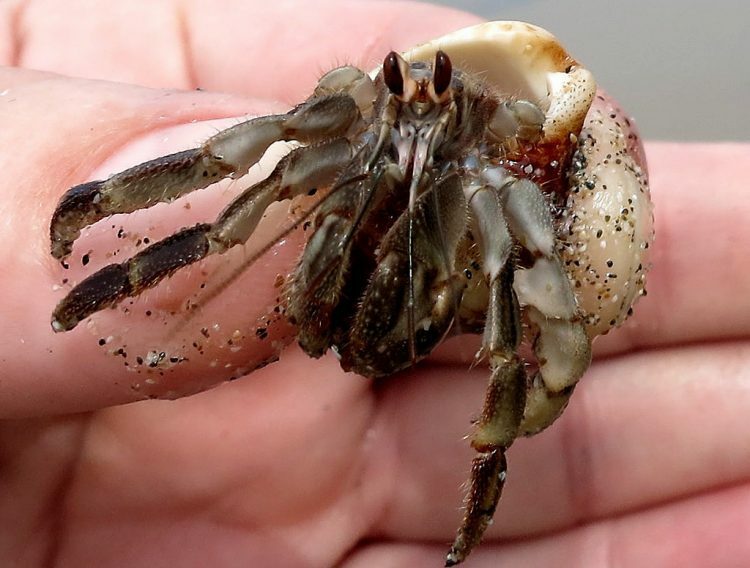 This size will provide enough room for 3–5 medium-sized crabs,” advises Sue Fox in Hermit Crabs. Ideally, you want an aquarium large enough to comfortably hold your hermit crabs, substrate, toys and dishes — and one that gives them space to run about. Hermit crabs need a temperature hovering around 75–85° F.
Because it’s unlikely that your home and their location will always be in this range, you’ll need to provide a heat source. You can purchase heating pads that go under the aquarium or a heat lamp — but hermit crabs don’t need extra light to be happy, so the pads are probably the easiest way to go. Hermit crabs need humidity, so be prepared to provide that as well. Use a simple spray bottle to mist your crabs and their habitat to keep things moist. These little guys love to play, so feel free to include some toys and shells in their habitat. All of the above can be purchased at a pet store. You’ll also need to provide food and water dishes for your hermies. “Your water bowl should be a non-metal dish that’s deep enough for the largest hermit crab to bathe in, but small enough that your smallest hermit crab won’t drown,” according to Secrets to Raising a Healthy Hermit Crab. Your food bowl should ideally be the same size or a bit smaller. Be sure to keep these dishes clean and slime-free. If you feed moist food, it should be changed out daily, but dry food can last a couple of days. There should always be food available for your hermies. Don’t forget to give your hermit crabs treats, which can also be purchased at pet stores. Only leave treats in the habitat for about 15 minutes, then remove whatever’s left. Lastly, your hermit crabs will need an additional source of calcium. You can purchase cuttlebone — this can remain in the habitat for as long as it lasts. 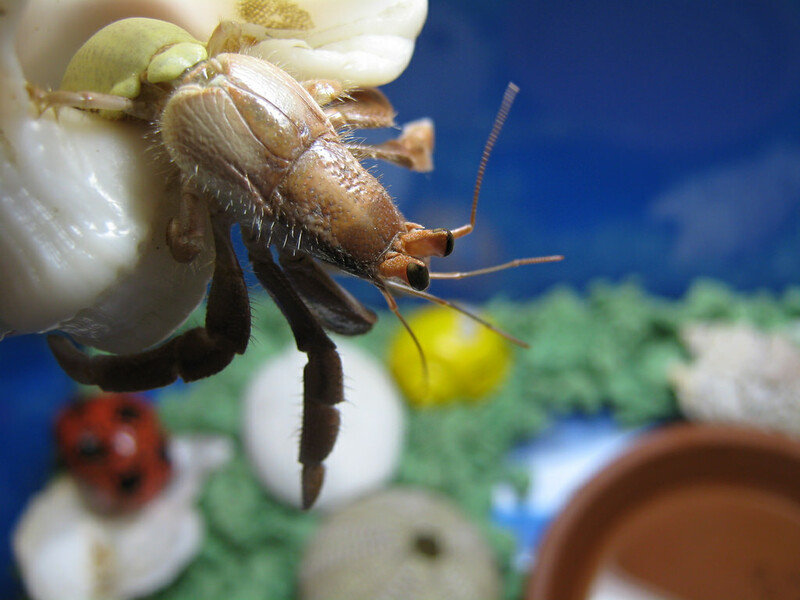 Handle your hermit crabs by picking them up carefully by their shell and placing them in the palm of your hand. All crabs are different. You may have a crab who doesn’t mind being handled, while you may have another who waves her claws threateningly when you so much as look in her direction. You can always wear gloves, and make sure to keep her over a soft surface in case she startles you or makes a run off the end of your hand. Hermit crabs are incredibly fun. Once you understand their needs, they’re also relatively easy to take care of. Just read up on and purchase your equipment before bringing them home. In short, don’t do what I did as a kid.